In summer season most people get the vacation, and most of them pack their bag for hiking. That’s why hikers become more active in hot weather. And we know that hiking is a great pass time. Because it gives us the chance to meet excellent trails and we can explore nature as well. But sometimes some hikers face trouble while hiking in the hot weather. And it happens either they have lack equipment or don’t have proper skills to hike in the summer. So, it is essential to learn the tactics before going on the hiking trail. And you may follow the tips regarding hot weather hiking if you have a plan to hike during summer. We recommend you try to avoid being naive especially when you are on the trail. You may face up with danger while hiking in hot weather. So, it is essential to check the weather forecast before considering a hike. And remember that the mountains often create their climate, so you can’t be sure always about the weather. Especially when it is incredibly wet, it is known that unexpected mountain-rain may occur. And this type of rain can cause severe problems to unconscious hikers. Besides that, thunderstorms are also much more likely to happen when it is hot. So, you need to check the weather before departure. One of the essential tips for hiking in warm climates is to choose the right trail. You should try to walk on a mountain ridge or in a shady forest. Otherwise, all tips may become useless if you choose the wrong path. So, you may select a path containing at least some shaded sections. And it will be better if your trail comes along with running water. Therefore, you get drinking water (after purifying) and also will have the opportunity to refresh yourself. Lastly, try to select a low-altitude path as it is the best option for hot weather. Because we know that the higher you go up, the lower the amount of oxygen you get. Although people wear fewer clothes, we recommend hikers to wear more clothes when hiking in hot climates. Long-sleeves shirts and hiking pants can be your best friends when it’s hot. As we know, if we wear clothes which come with a few light layers, we will get proper insulation. However, it is essential that your clothes are loose enough for better airflow and keeps you fresh. And you may know that people, who live in the desert and ride camels, usually wear a lot of clothes. And it will be excellent if you use synthetic clothing as it absorbs moisture. As a result, when you sweat a lot, these clothes will absorb moisture and prevent chafing as well. Also, you should wear a large hiking hat, plenty of sunscreen and UV-blocking sunglasses. It is essential to stay hydrated when you are on the trail. And it is necessary for you if you hike in hot weather. As you know, your body loses about one liter of water per hour during a regular walk. But a challenging outing in warm climates can double that amount. It is helpful to know that your body can only effectively absorb half a liter per hour. And no matter what you do, you will be dehydrated during a walk in hot weather. So, you need to ensure you drink plenty of fluids. And we recommend you to take more water than regular need and drink regularly. When hiking in hot weather, sweating is a fact. Drinking plenty of water is essential to restore the level of fluid in your body. It is equally important to replenish electrolytes lost through sweat. Again potassium and sodium are the most critical elements among these electrolytes. They play an essential role in controlling your energy levels. That’s why you need to bring many snacks which contain complex carbohydrates. Energy bars and fruit are excellent sources of complex carbohydrates. You can also bring mixtures of electrolytes or tablets. And you should try to stay away from simple carbohydrates such as sugary drinks and sweets. Sweating is not only the cause of scouring but also blisters. That’s why we recommend that you pack an extra pair of hiking socks for your comfort. As you know, nothing is more relaxing than being able to change socks which are soaked in sweat. And if you take a long walk, you can wash your dirty socks in a river. Then you can tie it to the outside of your backpack to dry it. Also, another great thing you can take with you is the insect repellent. The combination of warm weather, shady forest, and a sweaty hiker often leads to a swarm of irritating insects. So, you should forget to keep a bug spray in your backpack. Besides drinking regularly and eating salty snacks, you should also need to take a break. You may put down your backpack, and then you should take a seat or lie down and give your body the necessary rest. You can also take off your hiking boots to ventilate your feet and sweaty socks. And we know that regular breaks help us to cool down our body and wick away sweat. So, undoubtedly it is essential to take frequent breaks. 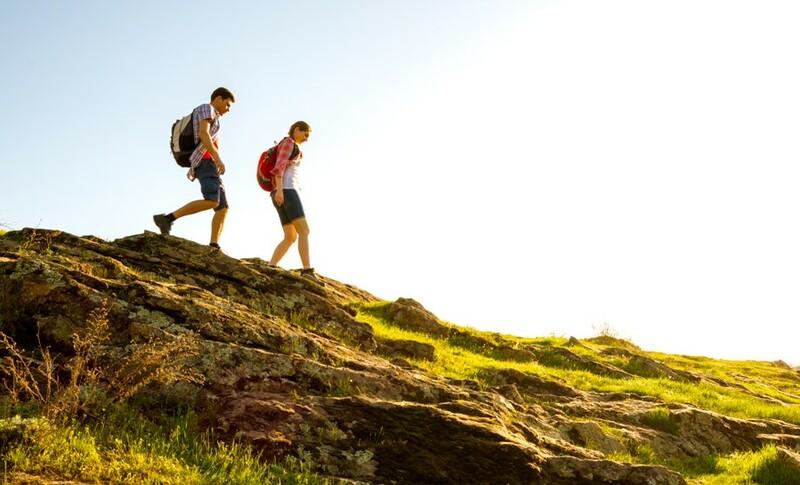 Although the above tips for hiking in hot weather should make your summer trip a success, it is still possible that you can’t correctly enjoy your adventure. There can be many risks involved in hiking and heat stroke can be the major one. So, you should be aware of the symptoms of heat stroke. The most common signs of heat stroke are nausea, muscle cramps, headache, dizziness, disorientation, and lack of sweating even at high temperatures. That’s why you need to always listen to your body. You have to eat when you are hungry and need to take rest when you feel tired. Even then if you or your partner feel sick, you need to find shade immediately and try to cool down as quickly as possible. Sometimes people like hiking in hot weather. They love the discomfort and physical challenge. But they are always prepared for the trail. They keep themselves hydrated, and also keep their head covered. Besides that, they carry salty snacks, water, and short clothes, which are essential for any hiker. However, the list above can help a hiker who wants to go hiking in hot weather. Although these steps are crucial, you will need to think about your skills, gear, and tools. Therefore, you can use the knowledge when you are in danger.